Strengthened by its successful sales with more than 9000 units sold for the equestrian sports, the company is pursuing its development by taking on motorsports activities with a very innovative helmet camera. The Cambox Mkv3, that is its name, carries the codes that have made the success of the previous versions but in a more modern way and closer from current standards. The exclusive and very speciﬁc boomerang shape of the Cambox made it possible for it to ﬁt the user’s forehead and his helmet shape. Its 2 articulated arms also made it possible for it to be fastened to an enduro or a motocross helmet by ﬁtting all kind of visors. The setup of the camera is done very easily by the user that is going to place by himself the adhesive Velcro© fastener under the visor or inside his helmet. The Cambox is already equipped of a female Velcro© fastener that is allowing to fasten it easily and quickly by sticking this female part to the male Velcro© part placed on the helmet. It is important to note that a ULTRAGRIP Velcro© fastener is also available for intensive and competitive use with a high-adherence glue. 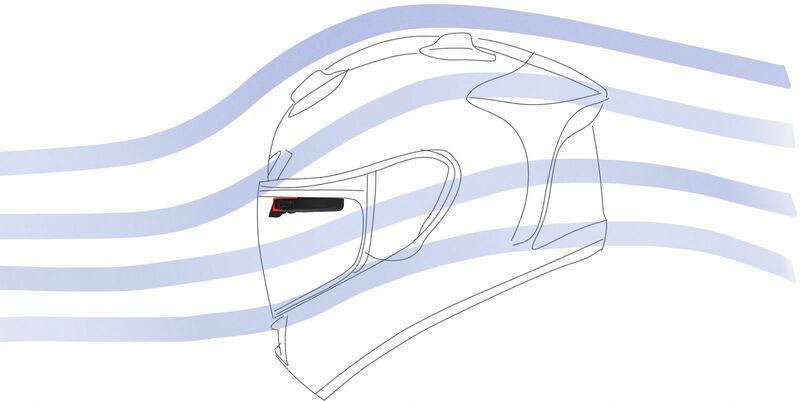 The Cambox is reinventing the helmet camera by offering a new concept of smart, discreet, design, light but above all safe as it preserves the integrity of the helmet by conserving its ﬁrst purpose : to protect the user head. Its miniaturized format allows the Cambox to be placed inside all helmets including those equipped of a double visor. Opened or closed visor, clear or tinted, the camera automatically adapts the brightness in real time like the eyes of a human being. 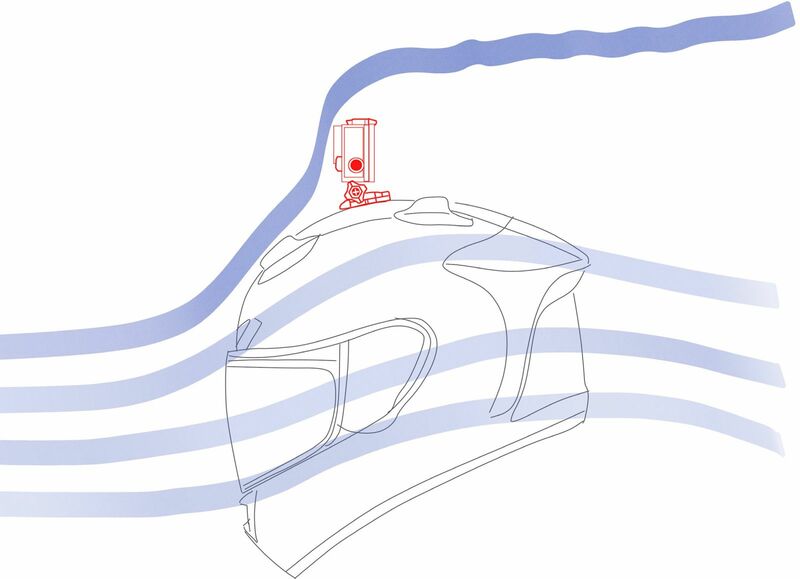 The Cambox camera, thanks to its curved shape, is fully integrated to the helmet or to the visor thus it is protected from shocks in a fall and prevents all risks of snagging with external factors (branches, pipes, wires…). Its exclusive positioning and its video lens centered between the eyes allow to ﬁlm close from the gaze, all of this without reducing the user’s ﬁeld of view. Thus the Cambox offers a new alternative to ﬁlm with the hands free what you are looking to in order to capture your best feelings freely. The Cambox Mkv3 delivers high quality images thanks to its SONY© video sensor and its immersive ambient sound thanks to its 2 HD microphones placed in each arm of the camera. The Cambox beneﬁts from an embedded wiﬁ antenna and from a free app to be downloaded on a smartphone. In 2011, Jean-Marc PIEDNOIR was looking for a solution in order to ﬁlm easily his horse rides, to do so he tried all types of onboard cameras, from recording glasses to action cameras. Convinced by his riding friends that existing products are presenting drawbacks like the weight, fastening system, safety and a lack of discretion and design, Jean-Marc then imagined a revolutionary camera concept. This takes the shape of a boomerang and is placed under the helmet visor. He then designed in 2012 a ﬁrst prototype from a simple piece of cardboard on which he welds and sticks the components. Following numerous conclusive tests in the equestrian ﬁeld, the project starts oﬃcially in 2013 to manufacture and market this camera under the name of Cambox, contraction of the words Camera and Box. The Cambox is an innovative product both thanks to its concept but also thanks to its manufacturing process based on the revolutionary 3D printing process. Thus, Cambox Vision group designs and manufactures thanks to its 18 3D printers all plastic parts that subsequently are assembled in its workshop near Nantes to offer a Made in France product. In a growing market, the Cambox Vision start-up is planning on launching a new fundraising in 2019 in order to accelerate its international development and to market new products on others areas of activities. Cambox and its associated brands as well as their respective logos are trademarks that are registered in France and others countries. All others brands are the property of their respective owners. The Cambox is protected by a patent-pending, registered in several countries. Cambox Meca is a brand of the Cambox Vision group. The Cambox Mkv2 (249€ including VAT) and the New Cambox Mkv3 (349€ including VAT) are available as of now worldwide in different versions and colors.